Ninja-K, Livewire, Punk Mambo, and Dr. Mist are free-falling out of Ging-R, who is incapacitated. They manage to land safely, but they are immediately confronted by the Jonin, Ultimo, Kostiy the Deathless, and Linton March. 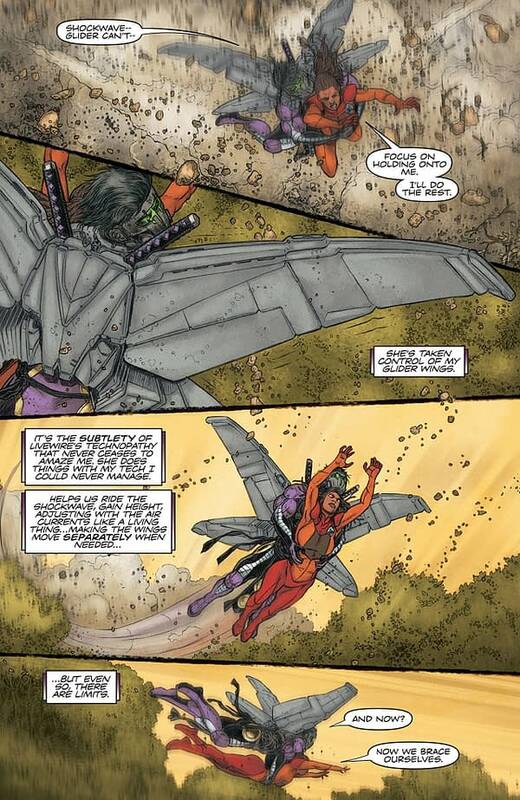 The fight begins immediately, but Ninja-K and Livewire still have their missions. They need to destroy the Jonin’s facility and discover what they are doing in Mexico. This is a simple and highly enjoyable issue of Ninja-K. The comic gets straight to the action and triumphs for it. We get to see Ninja-K and his allies fight the immortal and powerful villains, and it plays out like a classic superhero fight. There are some twists along the way, many of which come when Colin infiltrates the facility and discovers what lies within. 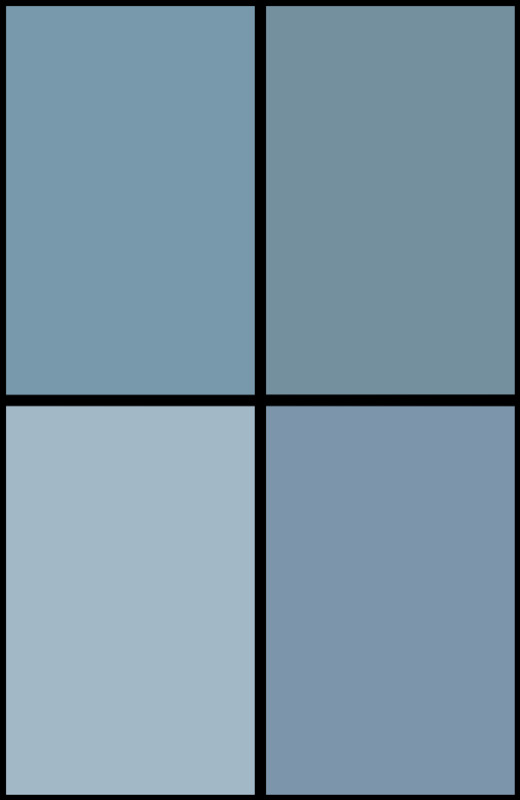 Another classic Valiant character gets to make a cameo here, and it’s one I’m personally fond of. To the comic’s credit, I found myself forgetting many of the issues I had with the plot setup (namely villainizing Mexico rather viciously). This is partially because the geopolitical angles were dropped completely in favor of the aforementioned hero vs. villain team fight. Why awkwardly villainize an entire nation when you have plenty of decent supervillains lying around? Juan Jose Ryp triumphs in this setup, playing with the powers and fighting styles of the characters in sequences of beautifully controlled chaos. The fight scenes are punchy and intricate, the characters are well-detailed and look generally badass, and the environments are given due attention to make them vibrant. Jordie Bellaire contributes the color art here, and she gives it a lively balance of darker colors and the occasional neon shade. 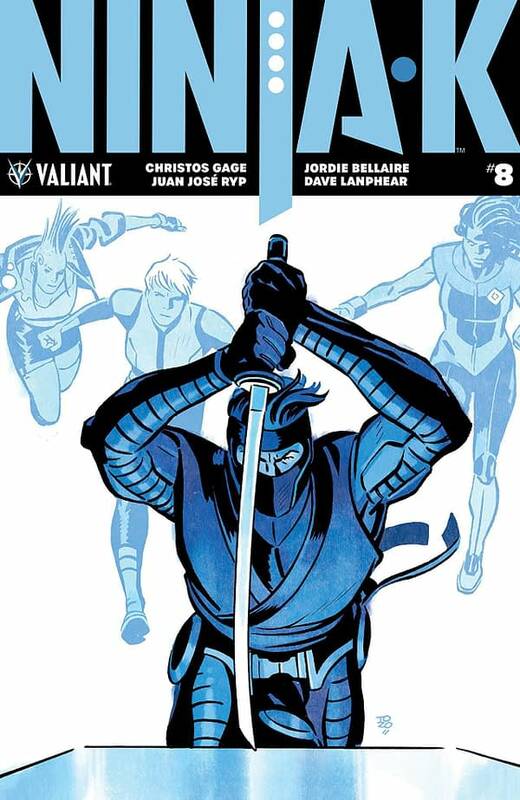 Ninja-K #8 has me fully invested in this series again, as this issue shows how fun and engaging the series can be. Sometimes a simple superhero team versus supervillain team fight is all you need. This one comes with a recommendation. Check it out.